A long-term study of the links between climate and marine life along the rapidly warming West Antarctic Peninsula reveals how changes in physical factors such as wind speed and sea-ice cover send ripples up the food chain, with impacts on everything from single-celled algae to penguins. The study, published in today’s issue of Nature Communications, is authored by Dr. Grace Saba, an alumna of William & Mary’s Virginia Institute of Marine Science (now at Rutgers University); VIMS professor Deborah Steinberg; Dr. Vincent Saba, a VIMS alumnus now at NOAA’s National Marine Fisheries Service; and colleagues with the Polar Oceans Research Group, Lamont-Doherty Earth Observatory, Woods Hole Oceanographic Institution, and the University of Colorado at Boulder. The authors are members of the Palmer Long-Term Ecological Research program (PAL-LTER), which conducts annual shipboard surveys along the western side of the Antarctic Peninsula, including the coastal ocean near Palmer Station­—one of the three U.S. research stations in Antarctica. Program scientists began studying the fast-changing region in 1990. Steinberg, one of the Palmer program’s lead scientists since 2008, says the current study provides one of the few instances where marine researchers have a dataset of sufficient length and detail to reveal how climate signals can reverberate through a polar food web. “That’s the importance of long-term ecosystem monitoring,” says Steinberg. “It provides the data needed to separate a signal from the noise, and to determine how plants and animals interact with both their physical environment and each other. That knowledge is critical as climate warming continues to impact this polar ocean ecosystem.” The West Antarctic Peninsula is one of the fastest warming regions on Earth, with annual winter temperatures increasing by 11°F during the last 50 years. The team’s research shows that populations of photosynthetic algae—the tiny drifting plants that support the polar food web—peak every 4 to 6 years in the waters along the West Antarctic Peninsula. These blooms correlate with a negative phase of the “Southern Annular Mode,” or SAM, a seesaw shift in atmospheric pressure between mid-latitudes and Antarctica. In winter during a negative phase of SAM, cold southerly winds blow across the Peninsula, increasing the extent of winter ice. From spring into summer, winds are significantly reduced, delaying ice retreat. “The combination of a windy winter with heavy sea ice followed by a calm spring favors the development and persistence of a stable water column in the summer along the West Antarctic Peninsula,” says Saba. This stable, or stratified water column, with a layer of fresher, less-dense ice-melt floating atop a saltier layer below, encourages phytoplankton growth, likely by keeping the tiny plants nearer the sunlit surface and in proximity to the iron-rich glacial meltwater they need to thrive. Moving up the food chain, the team’s sampling reveals that the area’s periodic, climate-driven phytoplankton blooms are a key to krill “recruitment”—the addition of new, young individuals into the krill population. 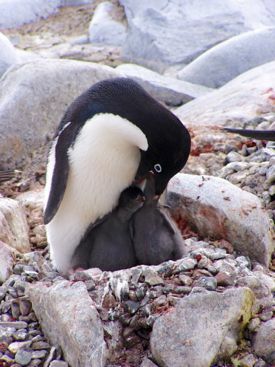 Adélie penguins and other top predators in the Antarctic food web rely on a robust population of krill prey for their own health and reproductive success. Ongoing work by Palmer scientists shows that the population of Adélie penguins near Palmer Station has fallen 85% since 1974. 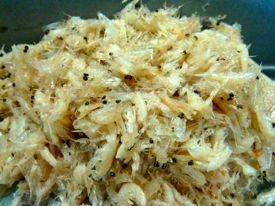 Though the researchers stop short of attributing this decline solely to a climate-related shortage of krill, they do express concern for the future given that climate models project an increase in the occurrence of positive SAM episodes during the coming century. In addition to Adélie penguins, krill are the main food source for Antarctic fur seals, macaroni and gentoo penguins, and albatross. They also feed baleen whales such as humpbacks.